Hope Ranch is one of the most desirable neighborhoods in Santa Barbara. Hope Ranch was once part of an original coastal Spanish Land Grant. In the 1920’s and 1930’s it was developed into what is now approximately 1,863 acres with about 773 estate like homes nestled into a rural setting minutes from downtown Santa Barbara. With lots no smaller than 1 acre and up to multiple acreages, Hope Ranch has some of the most luxurious properties offering both spectacular ocean-front estates and exquisite equestrian estates. The residents enjoy a private and gated beach, tennis courts and miles of beautiful equestrian trails. The private, members only, La Cumbre Country Club offers all residents views of the beautiful Laguna Blanca Lake and greens of the golf course. Located about 90 miles north of Los Angeles, along the coast. Geographically Santa Barbara nestles into a curved coastline which faces south ~ not west ~ and to its back, a line of dramatic coastal mountains. Off the coast, are a group of five islands which serve to buffer harsh seas and weather. Our year round weather is due in part to this very unique geography of islands, south facing beaches and a coastal range of mountains to the north. The sought-after Laguna Blanca private school (grades 5-12) is conveniently situated within Hope Ranch. Nestled between the sea and mountains in exclusive Hope Ranch, this approx 13-acre site spans two premiere parcels to showcase an enchanting French country estate. 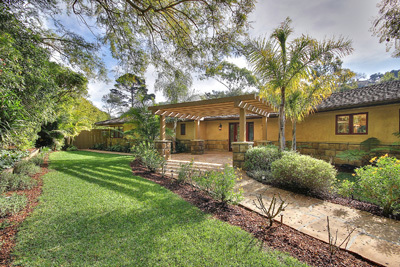 Serene Hope Ranch Oasis with a remodeled single-level 3 bedroom, 3.5 bath home. This 2.1 acre property is nestled amongst mature oaks and tropical landscape in a private setting that borders the bridle trails of the ranch. 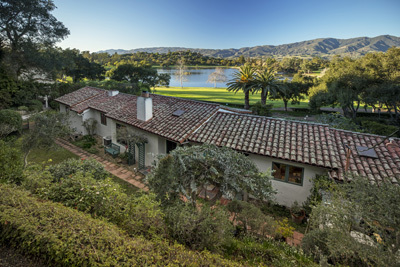 Fabulous Pied-e-Terre overlooking the La Cumbre Country Club in coveted Hope Ranch.